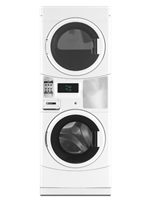 Maytag Commercial Coin Op Stacked Electric Heat (2 x 9kg) Washer/Dryer. Go to the Richard Jay website for more info here. Maytag Commercial Manual Stacked Electric Heat (2 x 9kg) Washer/Dryer. Go to the Richard Jay website for more info here. Maytag Commercial Coin Op 9kg Washer. Go to the Richard Jay website for more info here. Pedestal- 25cm for Maytag MHN30/33 washers or MDE/MDG25/28 dryers. (Image shows machine installed on pedestal which makes loading and unloading easier) Machine is not included. Contact Richard Jay for more info here.